The 708 Series LED courtesy light was designed with larger yachts (and megayachts) in mind. It features fully sealed electronics and an AISI 316 stainless cover plate. Despite its flat profile, it is completely surface-mounted for ease of installation. Its low profile and indirect illumination make it ideal for stairs and walkway lighting. For a slight variation on this design, please consider the 707 Series models, scroll down for more info. These popular interior/exterior LED courtesy lights have recently been upgraded with a new dc to dc constant current driver delivering long term performance across a wide voltage range. Now easier to install with reliable & strong self-adhesive tape (no more screws!). 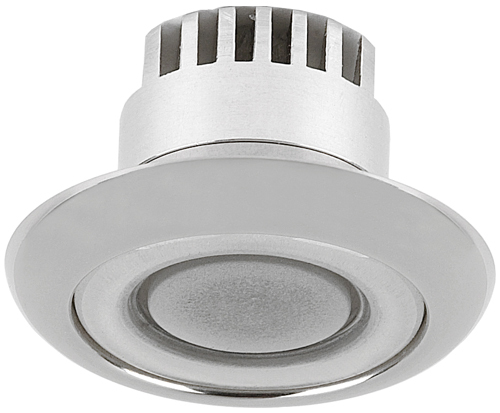 They combine the robust characteristics of solid state lighting with a design that is impervious to water ingress and resistant to salt corrosion. Offered in a polished stainless steel finish with limited external protrusion for low profile good looks.